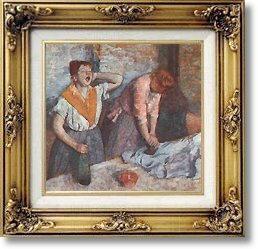 The Laundresses by Edgar Degas - no-risk guarantee! Degas was born in 1834 into a rich Franco-Italian banking family with branches in Paris, Naples and New Orleans. He was never short of money and never doubted his vocation as a painter. He never married, saying, "I would have been in mortal misery all my life for fear my wife might say, 'That's a pretty little thing,' after I had finished a picture."